Acer Aspire V5-571 is a very capable laptop which is offered in couple different variations depending on the processor, the memory capacity and the place for storage. There is a touchscreen version of this laptop as well but we will review it some time soon. Today we are going to take a closer look at the Intel Core i3 version of the Acer Aspire V5-571 laptop which is currently on sale at eBay Dabs Outlet for just £300 and now we I will tell you why I think it is a very good deal. 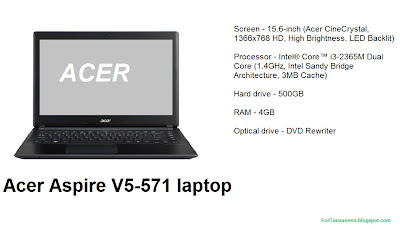 As you can see the Acer Aspire V5-571 is very well equipped with almost any option you may need. of course these are not the highest specifications you can find out there especially concerning the processor but these are more than enough for Internet browsing, doing some office work, watching HD movies and videos etc. The price is also pretty good so you can hardly go wrong with this laptop. Probably one of the biggest competitors of the Aspire V5-571 is the well known Fujitsu Lifebook AH512 which has similar specs and is offered at even lower price. You can also check the Acer Aspire E1-571 laptop review. I agree with you post that Acer Aspire V5-571 is very capable and yet affordable Windows 8 laptop. Thanks for sharing this great post.